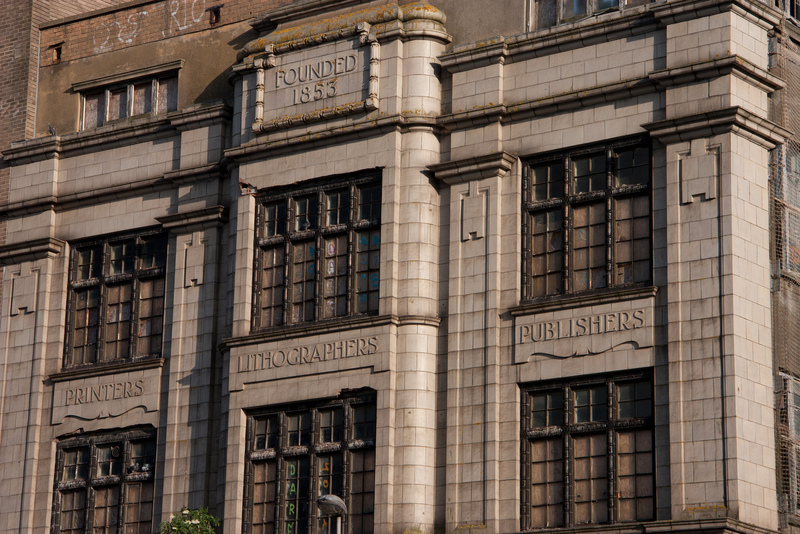 Contracts have been exchanged for the purchase of the Observer Building in Hastings. Completion is expected on Weds 13th Feb 2019. The new owner is White Rock Neighbourhood Ventures (WRNV) (*1), a community-rooted developer owned by three socially-driven organisations, with voluntary covenants in the Shareholders Agreement to retain capped rents in perpetuity. Sounds really dull! Why does this matter? On the other hand, Robert Tressell’s name for the local paper ‘The Obscurer’, reminds us that the extraordinary FJ Parsons empire in the America Ground area of Hastings was by no means politically or socially neutral. But it was definitely lively and important – 500 jobs at its height and a position of real power and responsibility in an age where the local paper was pretty much the only source of local news. Now here we are in 2019. 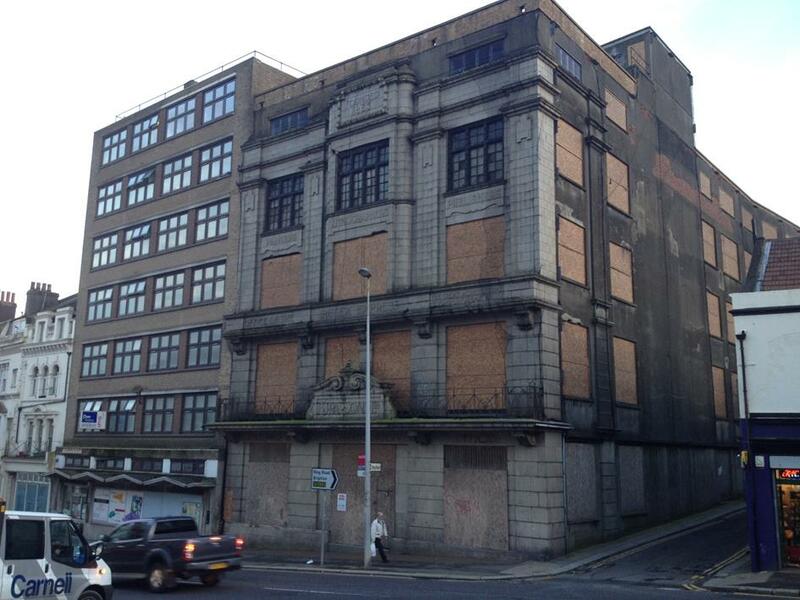 The building has been empty and increasingly derelict for 34 years (bar the memorable 1-year meanwhile use in 2016). Far from being ‘unproductive’, however, it has made a profit (sic) for almost every owner over the years (*2). Buy cheap, get planning permission, sell on. Perfectly normal way to make a profit. Make almost no effort to protect or improve the building. Shame but the value just isn’t there. The globally-connected flows of capital that sweep in and out of places with no regard shown or expected towards any purely local interest. That’s just the way the world is now. But it’s not ok and it doesn’t have to be like this. It is possible to change things. Maybe you have to play some games – jump in, do the deal, climb out, wash off. But then, with freehold ownership, you can do what you want. And what we want is a sustainable asset that provides jobs, homes, leisure, opportunities and comfort to the people of Hastings. At a cost they can actually afford, and where the money keeps going back round the local economy as many times as possible. That’s why the capped rents matter – they mean there will always be some affordable places to live and work in the town centre. As the rents rise around us and more homes disappear into AirBnB-land, we hope that the little ‘ecosystem’ of capped rents being created in this neighbourhood will help to protect its soul – often described, for want of a better word, as ‘quirky’. The other unique thing about these buildings and the ethos behind them is ‘community self-management’ or ‘dweller control’ – tenants, investors, users and other supporters pitch in together to make them great spaces and it is seen as normal to contribute to the physical and social upkeep of the buildings and the area. That effort underpins the affordable rents but it also makes for an interesting, supportive and sustainable neighbourhood. 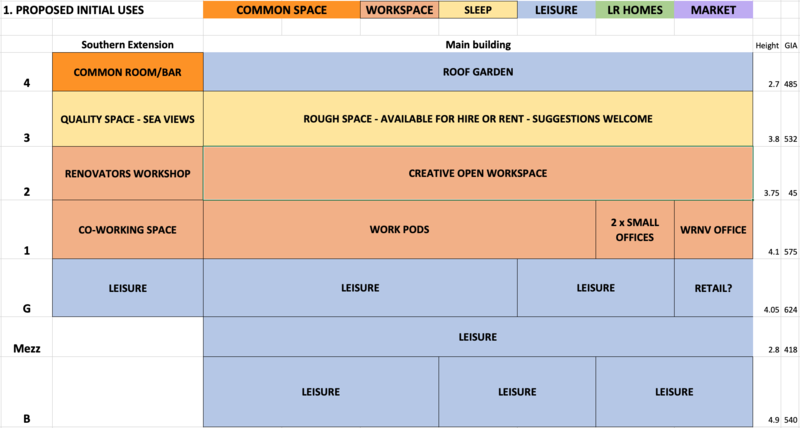 We are excited that Heart of Hastings Community Land Trust will be running a month-long Organisation Workshop in the Observer Building during May 2019 – a great example of how WRNV plans to work with others to squeeze this building for every possible life-changing opportunity for local people. Here’s what we hope to be able to create within 12-18 months. We’re currently assessing the options for the lower 3 floors leisure offer, which could include lots of small scale businesses, for example a market in the souk style. We want to create genuinely affordable housing in the building and have been talking with Heart of Hastings CLT and other organisations about creating 16 ‘Living Rents’ apartments – with rents at 1/3 of local median income (which is currently £19k pa, so rents of around £525 pcm). And eventually, perhaps, in 8-10 years time, it might be worth building market sales housing on top in order to pay back the loans to keep the buildings sustainable and affordable in perpetuity. 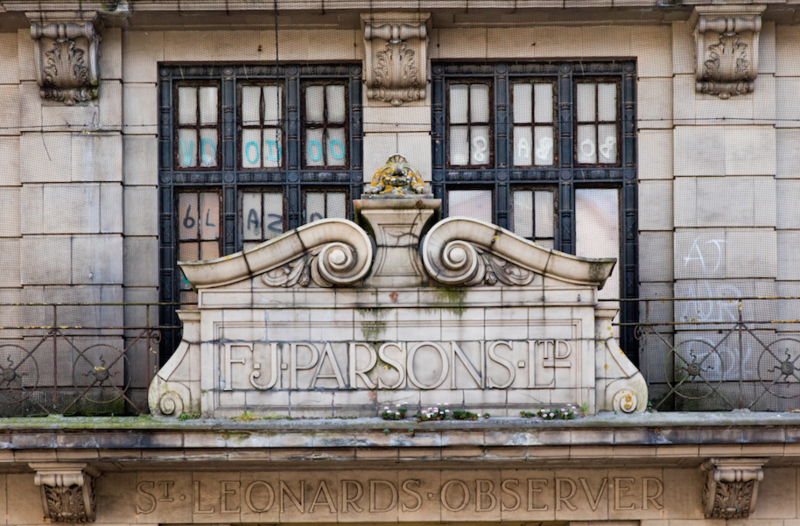 What happens next in the Observer Building will depend on the enthusiasm of local people and businesses to take this opportunity to make something wonderful. If you want to be part of it please put in an expression of interest. Or if you just want to be kept informed, join the mailing list. Please also check out the Crowdfunder. It includes a really great film by Adam Clements of Tree Tunnel and Andy Davies of Campaign Film, plus loads of wonderful rewards donated by local artists and businesses. Having maxxed out on the purchase, we need funds to help make the building waterproof and kickstart the long process of resuscitation. But more than that, these donations will show the larger funders how much people want to see this change happen. If you want to get this building open again and doing good, please make a donation, however small, and leave a message about what you want the OB to be. *1 White Rock Neighbourhood Ventures was established by Meanwhile Space CIC and Jericho Road Solutions in 2014. One third share is currently held by the national funder Power to Change who will be handing it over to a community-based organisation in the coming months. *2 except for an investment bank who ended up holding the baby when the owner they had lent to turned out to be a mortgage fraudster and then the Crash happened and eventually they sent the £4.2M asset they had on their books to auction with a £150k reserve price. Since last summer there has been a disturbing level of polarisation within the town about the pier. I hope that this statement will help to tackle that and remind us of the positivity that was the hallmark of the campaign to save the pier. This statement comes from me as an individual and I’d like to lay out my involvement as clearly as I can. I was one of the local people who got together to try to save the pier in 2006 when it was closed for safety reasons due to lack of investment by the private owner Ravenclaw (based in Panama). We set up Friends of Hastings Pier as a community group to keep the pier in the public eye. In January 2008 it became clear no-one else was going to rescue the pier so we set up Hastings Pier & White Rock Trust. HPWRT was like the ‘midwife’ to try to deliver a different future for the pier – we focused on funding, ownership, engineering, commercial propositions, and very high levels of community involvement. Once we were successful with HLF funding we established Hastings Pier Charity (HPC) to take the project forward and changed the name of HPWRT to White Rock Trust to focus on the rest of the neighbourhood. As the voluntary Treasurer, I played a leading role in overseeing the first phase of HLF funding – including supporting the main ‘Round 2’ bid to HLF for £11.5M, helping to raise the match-funding, working with the council to achieve the CPO, and seeing the organisation through the conversion from a charity to a charitable community benefit society so that it could raise community shares. I resigned from Hastings Pier Charity in January 2014 as it seemed that everything was in place – the ownership, funds for restoration, the board and a staff team. I became just an ordinary shareholder, delighted that the pier was being restored. I got on with other stuff, including the transformation of Rock House and helping to set up Heart of Hastings Community Land Trust to achieve homes and workspaces for local people that will be affordable in perpetuity. I was asked by the new chair of the HPC board to get involved again briefly in 2017, in a paid role for the first and only time, mainly helping with financial modelling (it was my spreadsheets that the Administrators sent out to potential bidders). That was when it became clear that the pier operation was not financially sustainable. Faced with daunting distractions like a £1M impact storm and an underperforming private catering contract, they had lost sight of ‘Phase 2’ – the need for investment for a new building and an active programme to drive footfall and dwell-time. I was not consulted about the board’s decision to put Hastings Pier Charity into administration in November 2017 – the first I heard about it was the Administrator’s letter to shareholders. I was persuaded by others who had been involved in the original Friends of Hastings Pier that we should call a meeting for those who wanted to be active and constructive which we did in February 2018 – 60 people came, including Mr Gulzar. We then arranged a much bigger meeting on 23rd April with 500 people. That meeting voted that we should press forward trying to put together a bid that would satisfy the Administrators. All I can say is that we tried very hard indeed, and we tried to do that in a transparent way that involved as many people as possible. It was extremely hard work from Feb to June, entirely voluntary and generally very positive – focusing on the future while learning from the past. We mobilised lots of people to be ‘active and constructive’ (a constant theme throughout). We had all-welcome ‘tea and strategy’ sessions every Friday and lots of digital input. The business plan was available online throughout the ‘bidding’ process. I have been told that there is confusion about what we mean by a ‘community asset’. There is no formal definition but for me a community asset is a building or land that people care about, owned by a not-for-profit organisation to retain the value for local people, and enables local people to be involved in its development. That was what we were trying to achieve. [An Asset of Community Value is a different thing set up by the Localism Act (20111). These are usually owned by a private or state owner but nominated by a community group as being of community interest and therefore given some protection at disposal]. Our bid, of course, was not successful so it doesn’t make sense to spend much time on it. But I am told that there is a misinterpretation of what we were offering. Or rather that we shouldn’t complain because we didn’t make a cash offer for the purchase. Looking back it seems obvious but there was never a time when Smith & Williamson or anyone else involved gave any idea they were looking for cash. Even the estate agent didn’t push for money – he just kept refusing when we tried to negotiate for time. They stressed over and over that what they were looking for was a sustainable future for the pier that would respect the fact that it had been saved through community effort. 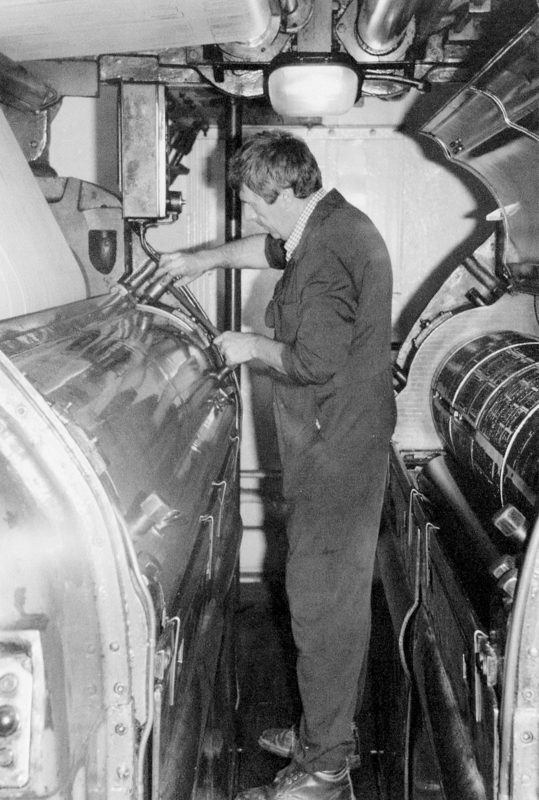 The ‘deep pockets’ frequently mentioned referred to someone who could sustain the losses for the first few years and invest both commercially and in the maintenance of the structure. So we focused everything on those points – financing a transition period, planning for a significant commercial investment of new covered space, and raising enough funds to keep the pier properly maintained and insured. Our business plan included detailed financial modelling and showed that with the resources pledged and projected we could achieve all of that. Business plans are notoriously unreliable, full of assumptions that might not come true. But they’re better than no plan at all. I’m happy to be held accountable for the quality of the bid, with all its errors and its ultimate lack of success. I still think it was as good as we could do. It would have been a leap of faith for the decision-makers to choose FOHP. It was a different blind jump they made in choosing Mr Gulzar. Another point where clarification has been requested is my views of the administration process. The Insolvency Act 1980 gives Administrators a very wide range of powers. As far as I know Smith & Williamson acted solely and legitimately within those powers. But I found it a bewildering process. There seemed to be no clear rules to it and certainly no scope for flexibility or collaboration for the sake of the pier. Nevertheless we kept going – business planning, developing a partnership, crowdfunding, leafleting, keeping people informed, and trying to keep up morale for the pier staff and volunteers for whom this was a horrible time of uncertainty. I sincerely regret the high emotions on the night of the sale and I apologise to Mr Gulzar if he found it upsetting. I’ll give some explanation, though not as an excuse, just for information. 15th June 2018 was a very stressful day at the end of a very stressful 6 months. The previous day we had put in our ‘final offer’ (ie the most refined version of the Friends Plan for Hastings Pier, with financial information and the draft Heads of Terms for our partnership with a commercial operator). But I woke up to rumours that the pier had been sold for £35,000, later people said it was £50,000. Maybe we had all been stupid, but suddenly ‘the penny dropped’ as it were. They were looking for cash! Well, we could do that kind of cash – I picked up my company chequebook, secure in the knowledge that other people would help fund this, we could just about cover it temporarily and we were about to hit our £500,000 target on Crowdfunder. People began to gather on the pier to find out what was going on. The place was full of media crews swapping gossip they were getting from Eastbourne. I think the word is ‘febrile’, and it was also incredibly hot. We were there all day. At 12 noon I received an email from Adam Stephens at Smith & Williamson stating that ‘no decision has been made’. We waited until 7pm and then gave up. So when I got a call at 9.30pm saying Mr Gulzar was on his way to claim his pier I was not in the best of moods! I headed back down and we invited other volunteers to join us. Many people have criticised my attempt to buy the pier back from Mr Gulzar. They may well be right. It’s certainly a key regret in an otherwise proud story. But I couldn’t think what else to do. It felt like there was this one last thing we could try – maybe he would say, “yes you can invest that money and we can work together”. I was very tense but quite polite. Emotions ran high tonight so we decided it was best to give you space. As you know we are very concerned about the future of the pier and the impact on the community of this private sale. However it will be important to explore ways of working together for the benefit of Hastings Pier. I plan to be on the pier this Sunday afternoon. Are you available to meet to discuss your plans to engage with the local community? I have nothing at all against Mr Gulzar. He didn’t do anything wrong, just took a perfectly reasonable opportunity. From the little I know of him I think he loves the pier and is doing his best. He has certainly taken on a challenging asset. Both within FOHP and on my own behalf I have said over and over that the issue is not with Mr Gulzar as owner. The only thing that matters is the long-term protection of the pier. My problem has always been with the decision that a private owner would be better than a community owner. The dream for Hastings Pier was that it would be in community ownership (ie owned by people who cared primarily about the pier rather than about profit) and that would be a sustainable way forward for the long term – talking 20, 30, 50 years. After just two seasons from a late opening, I don’t think it was given enough time to prove that. I stood down from FOHP officially in front of 100 people on 2nd December 2018. Prior to that I tried to encourage mediation. We took advantage of a voluntary offer from a local resident with a strong background in negotiations to approach Mr Gulzar with suggestions about a memorandum of understanding that would serve and protect both ‘sides’. At first it seemed that might be possible but then Mr Gulzar changed his mind and wouldn’t talk anymore. I do understand that he has been very much in the spotlight. I don’t understand why he didn’t anticipate that and take action to build bridges from the start. To be clear I don’t think anybody should be abusing anyone else involved on social media or anywhere else. For what it’s worth, I would ask anyone that has any respect for me and for what we all did together as a community in rescuing the pier from the brink of destruction to the beauty that it is today, to give Mr Gulzar the benefit of the doubt, to support the pier now and to take the long term view. As citizens of Hastings we and the generations that come after us will need to look out for that pier. As Brighton, Colwyn Bay and too many other places can testify – once it’s gone, it’s gone. Hastings Pier is no longer my responsibility in any sense and this will be my last comment on it. As the owner, the main responsibility for the pier now lies with Mr Gulzar, but it would be unfair to let him carry all the weight. I will always support the pier, whoever owns it. Personally I have no problem at all with the gold, the animals, even the sheds and the slot machines. These are the ephemera of any particular season – they are not the essence of the pier. It has been with us for 150 years, loved by many people in the town over the generations. I hope that we can get over these nasty divisions and focus on looking after our town – the people as well as the pier. Thanks for reading, please share this statement to help clarify the situation and let’s go back to being the town that saved a pier. Until we as citizens understand ‘how the money works’ when it comes to developing land and buildings we will always be disadvantaged – land and buildings are where power is held. Without them the community sector will be forever undercapitalised. I am not an expert in property finance, not trained or qualified. But I have first-hand development experience, professional curiosity, and an insatiable desire to work out new ways to make things happen. As traditional regeneration approaches – which I would argue never really worked for communities in any case – fell by austerity’s wayside we have been piloting new forms of community investment. So I want to tell stories, not just about the impact of our projects on individual lives, on cultural and community activity, and on the local economy, but also about how they are financed so we can begin to demystify and democratise the development process. I do have an ulterior motive – ignorance leads to suspicion and I have sometimes suffer in my home town from rumours and bad-mouthing. I hope this goes some way to address that. The story of Rock House is long and convoluted. Here I’m going to tell it purely from the perspective of the money that came in to make it happen. month for my input) had been awarded a grant of £230k from HCA as part of the voluntary sector strand of the Empty Homes Initiative. Initially this was for a project in Margate but after a couple of buildings fell through they looked at Dover. When that too fell through I convinced them to come looking in Hastings. First we considered taking on the defunct Hastings Trust buildings in Robertson Street but that was moving very slowly. Meanwhile Space and White Rock Trust (which had emerged from the Hastings Pier & White Rock Trust) were both fascinated by the Alley behind Claremont and had together arranged for a meanwhile lease of the basement of the building that was to become Rock House, mainly in order to liven up the Alley and to keep an eye on the derelict 1924 Observer Building (OB) – at that point on its 13th owner since it became empty in 1985. This meant we were in position when Dyer & Hobbis called to say the owner of the freehold wanted to sell the building – did we want to buy? The asking price was £400k. I asked my friend Chris Brown from igloo regeneration to come and have a look. We walked around the building and he said ‘offer them half’. At the very same time the situation with the Observer Building (OB) was hotting up. Investec had lent large amounts to a man later convicted of mortgage fraud and they ended up owning the building which was listed in their books with a high (£4M+) valuation. After an aborted sale to a pleasant but deluded man from Essex called Tanjir Sugar, I had been working with Esther Brown (supported by a pre-feasibility grant from Social Investment Business) to encourage the council to consider a compulsory purchase. Jeremy Birch was getting interested. That pushed Investec to put it up for auction and it is a convention that local authorities dial down on CPO if there’s a chance of a new owner. Suddenly we were needing to compete to bring the building to safety. Mark Curry became chair of the White Rock Trust property group; Keith Sadler was lead negotiator. We spent a week on the phone back and forth with the auction house. I went begging to HBC, had a very memorable meeting with Jeremy Birch and Simon Hubbard which ended, amazingly, with them backing us with the promise of up to £350k so we could go and bid at auction. I rushed home… only to see on the auctioneer’s website: ‘SOLD PRIOR’. The weeks merge into each other in hindsight but these processes – trying to buy the OB, actually buying Rothermere House (as it was known then) – were running in parallel, and could easily have had different results. I called Ollie Dyer and (with butterflies in my stomach) offered £230k (I couldn’t bring myself to go to £200k – it just felt too cheeky – shows how naïve I was!). Ollie said yes but you’ll need to complete in 4 weeks. So how could we do that? In a sector dependent on grants and loans, where funders require you to point at a building and say we want to do that one and then take 3-6 months minimum to say yes? I remember standing over the road from the OB with Cllr Keith Glazier (Leader of ESCC) and Nick Hurd MP (Minister for Civic Society) and saying in a dynamic market that just doesn’t work. They nodded, and went back to their duties. We were left to work it out. There was one option. It was a bit crazy. When I describe it now I say: “I wanted to test whether people like me, people with equity in houses that they didn’t earn, could take some of that equity and invest it for good”. Ronan and I had been thinking for a while about buying a Hastings property and trying to be ‘good landlords’. Then I had started working with the Old Bakers in their base at Silchester Mews. We concluded what they needed was a ‘good landlord’. I spoke to Ronan about how maybe we could be that landlord and we opened negotiations with the owners Hastings Trust. But again, they were too slow (the charity is still not quite deceased even now). At the same time conversations were underway about the need to cap rents to protect the affordability that underpins the wonderful Hastings quirkiness (see Part 3 How the Money Works: Heart of Hastings, forthcoming). So we were ready to invest. We’d spoken with mortgage lenders. We were renewing our mortgage in any case. But even for us the timescale was punishingly tight. Stroke of luck – my mother was moving house and holding cash in the bank while she rented in between. I borrowed the money from her first of all and then within a couple of months repaid her once our mortgage came through. The money on my personal mortgage is loaned to Jericho Road Solutions which pays £350 a month back to cover that element of the mortgage payment. So Jericho Road invested £85,000 into Rock House at the most crucial moment of all. And we haven’t stopped investing since. We formed a company – White Rock Neighbourhood Ventures – 50/50 between Meanwhile Space CIC (MWS) and Jericho Road Solutions (JRS). Immediately I was keen to grant 10% of the shares to White Rock Trust, the 440-member community organisation I had spent the past 8 years developing. So JRS went down to 40%. We bought the building in July 2014 and took vacant possession of a 9-storey office block (1350sqm) in October 2014. Two useful stories about money. The first Quantity Surveyor we got to cost the renovation said it would be £1.98M. We freaked! Can’t do that. So then we brought in Charles Couzens of Ecos Maclean who was committed to reuse and a staged approach. In the end (by March 19) we will have spent about £1M on conversion. The main reason the owner wanted to sell was because the 25-year lease to Diageo was ending in Sept 2014. By buying in July we not only got the last quarter’s rent (about £15k) but also got to charge Diageo for ‘dilapidations’. This was not something we even knew about but with help from the Third Sector Alliance we ended up getting £115k extra towards the refurbishment. This is where pre-existing relationships helped again. Meanwhile Space had long been in discussion with Big Issue Invest. BII were keen to invest and had done all the due diligence. They lent us £250k to develop the six flats on the 4th and 5th floors. We got on with that, while developing further plans for other floors, and nurturing the building as it came alive. I was continually fundraising. I had been writing bids focused on ‘the rotting buildings at the heart of our community’ since 2013. We had some support from a pre-feasibility grant from Social Investment Business but now I was waiting for some of the funders to catch up. This was particularly true with the emerging Power to Change, which was to play a critically important role in Rock House’s survival and success. Power to Change was literally being invented in front of my eyes as a funder and support system for community businesses – a field I have occupied for the past quarter-century (since I was a co-founder of the Community Business Network in Deptford in 1993!). A dream come true at last. It took a long time but we were awarded a grant of £300k. We stretched every penny of it to deal with the ‘M&E’ (mechanical & engineering – everything to do with the building as a whole – plumbing, electrics, lighting, heating, fire safety, lift, etc) as well as transforming the Ground Floor into the Ground Control co-working space, the Project Space and the Living Room for the whole building. In the end it wasn’t enough (mainly because we needed a misting system to deal with the complexities of the fire safety regimes) and we went back like Oliver with his bowl and asked for more. Without cruelty or patronising, they looked at the case and agreed a further £58k to meet part of the shortfall – we found the rest through Meanwhile Space. That leads neatly to describe how we actually survived. Because making these projects work is only partly about making the spreadsheets tell good stories. It’s just as much about having a cushion when it doesn’t quite work out the way you expected. In the jargon, that’s called ‘working capital’ and when it comes to sheer survival, it’s like an airbag or a lifeboat. Without it you are likely to be… in trouble. Meanwhile Space (MWS) cash-flowed the build phases – in other words they paid all the bills whether or not funding had come in for them. 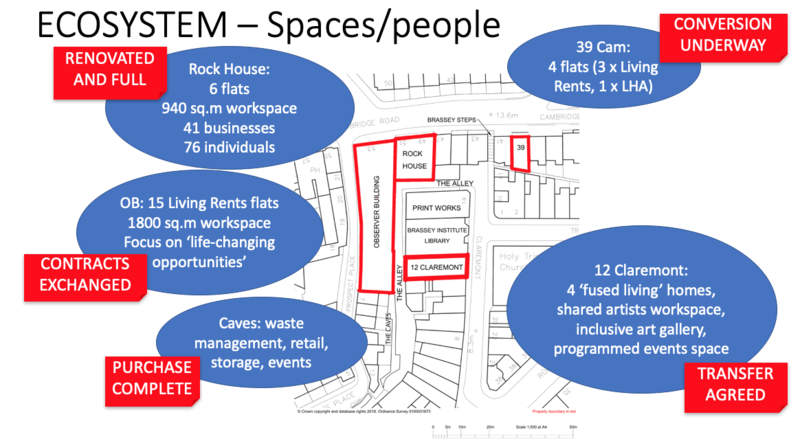 We transferred transactions to the WRNV bank account early on but still made active use of the MWS bank balance to fuel the redevelopment of Rock House for at least two whole years. By the end of it they were owed £91,000. WRNV didn’t have that money, but that’s the whole point of a committed investor – they stick it out. A year later Meanwhile Space agreed to convert £40,000 of the loan into a grant as match-funding for the Coastal Communities Fund. The remainder is being paid off on a monthly basis. In the middle of the redevelopment process, weird stuff happened. It’s not worth going into here but it led to Power to Change taking back the shares from White Rock Trust and becoming a one-third owner of WRNV and therefore Rock House. They (PTC) are currently working out how to pass their shares on to a bona fide community organisation. One further source of significant capital input has been the Coastal Communities Fund. In the summer of 2016, I was putting together a CCF bid for Rock House. Hastings Borough Council told us that so were the Source Park and so was the Pier and that they the council would be best to bring us together and put in an overall bid (as it turned out Source only wanted a small amount and the Pier dropped out). The Council took up the ‘slack’ in the budget but Rock House was granted just over £400k to ‘finish the building’ (6th floor, 2nd floor, Lower Ground and Basement) and support a local-economy led regeneration of the Alley. This work is underway, due for completion in spring 2019. The WRNV Shareholders’ Agreement envisages a situation in which the founder investors take out as much dividends as is prudent for the first 10 years, and then there is a 3-year window in which the community organisation partner (ie whoever takes over Power to Change shares) can buy out the other partners and own the whole building. The valuation at that point will be based on the covenant in perpetuity to cap rents with inflation. It will therefore represent a decent investment with a reasonable return. 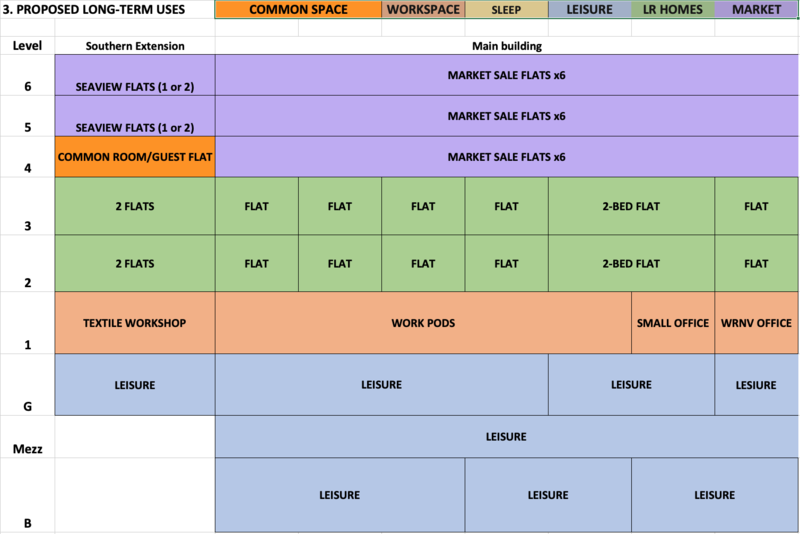 There is another complexity about mixed use, important to understand. Our tax advisors pointed out that the company that develops the whole building should pass the residential to a separate company. Don’t ask me exactly why – we never got a clear answer – but apparently this is the way it is done. So Meanwhile Space and Jericho Road set up Living Rents (Hastings) Ltd to be that ‘ResiCo’ and agreed a 150-year peppercorn lease on the 4th and 5th floors (ie the residential element) in exchange for taking on the responsibility for the £250,000 debt to BII that was associated with the flats. 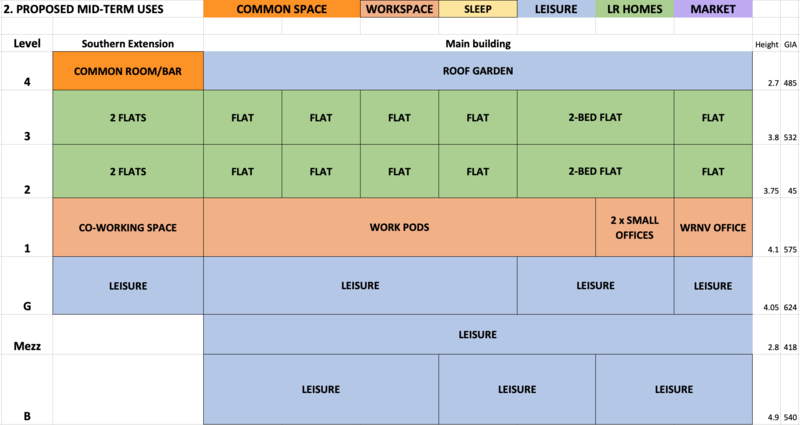 Living Rents has been the landlord for the homes ever since, working out as we go how to run this innovative approach to landlording, and is now providing a similar service for Heart of Hastings CLT at 39 Cambridge Road (for 5% of the total rents). I’m going to try to explain the financial package that Friends of Hastings Pier put together as simply as I can. This is both an exercise in extreme transparency and a practice run for some workshops I’m planning about how money works in land & building development (from a community perspective of course). I’m not going to name our commercial operator partner but detailed information about him and his support team was submitted to the Administrators and the estate agents on 14th June, along with the legal heads of terms of the agreement between us. Those of us who like to get things done often complain about procurement rules but we recognise they are there to ensure fairness and clarity. Instead throughout this administration process we have been lost in the world of the estate agent where there are no rules, just a driving desire to close the highest possible deal at the soonest possible time. That world of private property is also well known to be macho, aggressive, secretive, and unscrupulous. It is absolutely the wrong approach to a civic/community asset. At no point in the process since submitting our first proposal on 12th April did the Administrators explain what was going to happen next, how or when. When we met them on 11th May we asked to be put in touch with other bidders but heard nothing. On 13th June they asked us to ‘set out any revised plans by Noon tomorrow’ but did not commit to what they would do with them. After 3-4 months of that work, set a date with 6 weeks notice by which all potential proposals must come forward in whatever combinations they have chosen. While submitting detailed info to the Administrators, bidders also update their overview proposals online. Have an assessment process (2 weeks minimum) based on a clear set of criteria. Consult closely with relevant stakeholders, most obviously the local authority, but also including staff, volunteers, community and user groups. This could have been done in the same overall timeframe but been a better process leading almost certainly to a better decision. If this had been the process, and it had been clear from the start, then Friends of Hastings Pier could have focused on the job it initially set out to do – to give shareholders and supporters a voice in the process and the decision. Instead we were forced to take a position as a ‘bidder’ in a secretive and non-collaborative environment. Even so, though we will continue to complain about the process, we are convinced that even within that approach, ours was the best overall bid and should have been chosen. By the way it is revolutionary to share this kind of information about a bid publicly. Isn’t that ridiculous?! PURCHASE FREEHOLD OFFER: £55,000. This was emailed at 15.44 on 15/6/18 and followed up formally by our lawyer. This amount, and indeed more if necessary, was available in the form of a cheque from Jericho Road Solutions, as captured on camera by numerous media outlets that day. I have track record in applying Jericho Road assets to help make local projects happen. We were able to purchase Rock House because I put £85k on my mortgage. In this case it would have been every last penny we had in the bank. The amazing thing about finance in the community is that I could take that action knowing that others would help share the burden. SECURED AVAILABLE FINANCE: Total £750k, comprising £180k Crowdfunder (see below) and up to £570k secured on Operator assets. This would be used for working capital, both to install and fit out the new temporary structure, and to manage and underpin the costs until December 2020. At that point the pier would close for 3 months while the new permanent building was readied for the 2021 Season. CROWDFUNDER: Crowdfunder approached us on 25th April, a couple of days after the Urgent Public Meeting, via a conversation happening in the background with community shares specialist Dave Boyle. They had already put together a draft page. They have been brilliantly supportive throughout and we are gutted that they won’t get their fees. One of the great legacies of this process is the 800+ comments that explain why people donated. Very powerful indeed. We had to take a very rapid decision about target amount and date so that it could go live quickly. The noises from the Administrator, never clearly stated, never in writing, had been that we needed £1.2M – a figure apparently based on the pier losing £50k ever month, itself based on figures from February 2018. We rounded that down to £1M and said we’d get half through Crowdfunder and half from grants. In the meantime we got on with producing our financial model to see what a more realistic working capital requirement would be. But the target of £500k was too high for that kind of individual donor fundraising, especially in just one month. That meant that no amount of donating would be worth it – like trying to vote against in a safe seat. We had to do something about it! Chris Brown of igloo regeneration is an extraordinarily good problem-solver. Even he was pushed to his limits, trying to support a not-yet-incorporated organisation in an uncertain situation. But with his patience we worked out a good, clear deal. Igloo would provide £300,000 to the Crowdfunder as a short-term loan, repayable within 6 months with no interest charged. That certainly provided a great boost and within a few days a further £40k came in from other donors (in small amounts from £5 to £5,000). This ‘spurt’ and ‘splutter’ of crowd-funding is extremely stressful – end up checking it every 5 minutes! As we headed towards the deadline of 31st May it was going well but we were acutely aware that it was ‘all or nothing’. Crowdfunder called and asked if we wanted to extend – we hadn’t even realised it was an option! That’s where the 30th June deadline came from. By the time the Administrator announced the decision (9.30pm 15/6) the Crowdfunder had breached £475k and was clearly going to reach target. We would have drawn down the money, paid the Crowdfunder fees (£19k), repaid igloo and had £181k in the bank by 7th July. Before explaining how we could take on the pier if we only had £181k, let me say something about support ‘in the pipeline’. Lots of people have asked ‘why don’t you contact the bands that played on the pier?’ FOHP volunteers Amy Walker and Andrew Pearce have between them contacted pretty much all the managers and tweeted all the musicians who ever played there. Lots of goodwill, some swag to auction (thanks especially @BillyBragg), offers to play benefit gigs and to perform on our future pier. Right up to the last minute, as the story spread nationally across all the papers, we were being approached by all kinds of people wanting to see if they could help, including some pretty big hitters. There is no doubt it had begun to capture the imagination – just at that moment the Administrators gave it away ‘for a song’ – I wonder was it ‘(Can’t Get No) Satisfaction’ or ‘Madness’?! community businesses – the sense of solidarity was growing, especially after the tweet from the Bevy community pub in Brighton. Maybe this siphoning off of community assets into private ownership will wake the movement? architecture – with such excellent support from dRMM and from the University of Brighton’s Architecture School, we perhaps could have done more to get the attention of the architecture world sooner. Perhaps they’ll listen now? Our financial model showed that the working capital available from the Crowdfunder, the investment by the operator in the installation and fit-out of the temporary structure (estimated around £100k, (of which in this model £30k is shown as an FOHP contribution so that we knew that he would close the Crowdfunder gap if that became necessary in a hurry), and his guarantee to further underwrite pier working capital up to a maximum investment of £570k over 3 years, would be more than adequate for the Transition period. When tested for sensitivity in terms of visitor numbers and average spend per head the worst case scenario shows a total sunk capital of £630k in that period (in other words well within our guaranteed capital available). The detail of projected income and spend can be explored on the spreadsheet by those that choose to do so. The important conclusion is that the pier business would likely lose £100-£250k in Year 1, smaller losses or breakeven in Year 2, and make a surplus in Y3 of £50-120k. There is no doubt that the Pier is a challenging business to predict. My Christmas 2009 was absorbed in writing the first financial plan – no tourism expert, I made it up as best I could. Luckily we quickly found Leisure Development Partners and they put us on the right footing. I am convinced that the reason the Pier stumbled in 2017 was that Phase 2 – always essential to the LDP plan – had been forgotten and the all-important narrative that sustains these great totemic assets was grinding to a halt. I spent many hours last year, paid for the first time ever by Hastings Pier Charity, to create the spreadsheets, from scratch, that could at least model what was going on financially and what change would need to happen to turn it around. I have never seen any financial information since then about Hastings Pier that wasn’t based on those spreadsheets. You won’t be surprised to know that my hourly rate is a lot lower than the Administrators. I know more about piers than I ever expected to, but my role was not to be the expert – rather to hook the necessary expertise into the passionate grassroots, to draw on everything we know, the wisdom of crowds and the immense human asset of Hastings & St Leonards and their supporters everywhere. I’ve talked about the money here, but at the core of the plan to drive the business were the people of Hastings & St Leonards. One particular person who always gave me hope was the wonderful Adam Wide with his larger-than-life, boy-scout persona and his deep understanding of creative content for a visitor attraction. Both of us knew that there isn’t a better place in the world to go looking for ‘animators’ than this eccentric, extrovert, extraordinary town. Some things are hard to value on a spreadsheet. I hope that this gives some answers to the question of how the money would have worked. I’m happy to answer further questions and would welcome comments on how to present what is quite complex information more simply. I’m going to have a go at doing something similar for Rock House and Ore Valley in the next few weeks. I’m sick of people sniping in the background when they don’t know the facts. An entrepreneur is someone who sets out to do something when they don’t yet control the resources to do it. So I’m happy to share because I take pride in my ability to put together collaborative packages of financial and other support for projects that matter to people. After 19 crazy weeks of community mobilisation, commercial negotiation, late night bid-writing, endless spreadsheets, obsessive Crowdfunder checking, and the hard, hard work of keeping hope alive… this is me trying to make sense of what has happened, what has been achieved and the impact of our failure to protect something so precious that it makes grown-ups cry. I didn’t want to do any of this. When I heard that Hastings Pier Charity had gone into Administration in November 2017 I felt physically sick. A phone call with the Administrator in December sent me into a furious depression I haven’t experienced for 20 years. I couldn’t do any work, I couldn’t even bear to go into my office at home. I walked the dog a lot. In the woods Scuffle and I would often meet Lesley with her dog Nicky. Was she stalking me?! Whatever, she managed to persuade me we had to do something. And then Vidhya at Power to Change said they’d help with a grant. So we arranged the first meeting on 3rd Feb 2018. We tried to get participation from the Administrators, HLF and other funders. When they refused we decided to go ahead with a small and informal meeting for people who wanted to be active and constructive. That set the tone we have maintained throughout – we look forwards not backwards, we rise to the challenge, we adapt as necessary but maintain core principles that came from that first meeting and were voted on by 500 people at the public meeting on 23rd April. Alongside that local energy, I’d like to pay special tribute to some of the amazing people who have come from outside and fallen for Hastings and the People’s Pier. These are all very clever, successful people, highly respected within their own sectors (and much admired by me). Each in their own way pulled out all the stops for us, going way beyond any normal commercial relationship, because as we all know Hastings Pier is not a normal commercial proposition. While all our plans have been available online as they developed, the final proposal that we put to the Administrators is not, because it contains genuinely confidential commercial information. In brief, it was a co-investing shared venture between FOHP Trust and a commercial operator, backed with £750k of guaranteed finance, alongside current funding bids or approaches from funders totalling £450k, with dRMM contributing £60-90k of design work, plus a comprehensive funding search by an Institute of Fundraisers expert showing we could ‘absolutely’ raise £1.6M capital to achieve and open a permanent building within 3 years. We could start straight away – dRMM had pulled an all-nighter for us and designed a beautiful but simple and cheap temporary structure. In terms of operational capacity not only were we committed to working with the current team of staff and volunteers who have done so much to make this season a success so far, but our operator partner would bring in additional expertise and experienced staff to fill gaps and cope with a step-change in visitor numbers. The first thing we promised to do was actually count footfall – there is literally no data about how many people have been on the pier, let alone intelligence about who they were or what they thought. Our approach, of course, made a full and undoubted commitment to prioritise maintenance and to sustain the in-house engineering team which holds the crucial ‘corporate memory’ of the pier. First and foremost it was just inappropriate. It is wrong to use a commercial administration process for a civic/community asset, applying private property sector ‘solutions’ to a civic problem that the community is capable and willing to solve for itself given half a chance. I hope that @PeoplesBiz and @LocalityNews will help to campaign for a Community Administration Act or an amendment to the Cooperatives & Community Benefit Societies Act 2014 to establish a more suitable process for when a community asset faces financial difficulties. The behaviour around timescales to develop proposals – not just ours but other bidders too – was almost designed to exclude good options and to waste a lot of people’s valuable time. They would never give us a deadline date or an honest description of the decision-making process, it was all just estate agent hyper-stress(hurry, hurry, or you’ll lose it, imminent decision, can’t wait, no you can’t have 6 months/3 months/6 weeks/30 days etc). Procurement rules can be annoying but they are in place to create fairness and clarity to everyone involved – nothing like that in this process. There was an absence of governance and engagement from all the places we might have expected better. Appearing numerous times this week in the Guardian (and rather sweetly also the Epsom Guardian), the Daily Mail, the Telegraph and the Express (even more sweetly also the Aberdeen Evening Express! ), I think we can safely say this Pier is of interest to everyone across political and cultural divides. I have said it before: this is a totemic asset, meaning it belongs to everyone and everyone belongs to it. Yet our politicians have been absent, the Foreshore Trust impotent and, most egregiously, the Heritage Lottery Fund, in pole position as the only secured creditor, have hidden behind the Administrators, too scared of judicial review perhaps to institute a fair, open and engaging process that could achieve the best possible future for an asset of acknowledged national heritage and architectural significance. They have all missed an opportunity to connect with and support voters, taxpayers, and lottery players, and to harness the energy of local people to solve local challenges. Despite all these horrors, this process has had plenty of wonderful moments and outcomes – new and renewed friendships, hundreds of civic conversations, a new database of people who care about the pier, and an emerging solidarity among grassroots communities across the country. We are taking a few days to reflect and re-group. An update has gone out on the Crowdfunder and to our mailing list. At least five possible next steps present themselves. CHALLENGE. We think they made the wrong decision and we think they made the decision wrongly. Lots of people ask ‘is it legal?’. We know that commercial Administrators have very wide-ranging powers, but nevertheless the disposal process will come under intense scrutiny. PROTECTION. Immediately re-list the Pier as an Asset of Community Value. Work to beef up the pathetic 2-year ‘reversion clause’. Ask the council to seek an annual repairs report to be submitted to the Borough Engineer in recognition of the risk to them if it gets into trouble again. Keep 4,000 beady eyes on it. PIER RESERVE FUND. Establish a community-held fund, actively invested and topped up with new grants, donations and bequests, to help it grow over the years so that it is always ready in the event of an opportunity to bring the pier back into community ownership. THE PIER IN EXILE. One really exciting thing has been the people and businesses that have come to the fore, both passionate locals and supportive outsiders. We will find ways to keep that energy going this summer and beyond. A COMMUNITY ADMINISTRATION ACT. We will be looking for a suitable MP who will put forward a Private Members Bill to lay out a better process for the situation where a community asset is at stake and/or the organisation is a community benefit society. Personally I need to get some sleep and then try to start earning a living again. I do that mainly by helping community groups all over the country to take on challenging buildings that people love. Many of these projects involve Heritage Lottery Fund. I can only hope that my comments above will be taken not as an attack but as a frustrated cry of pain and a plea to learn lessons. We have so much to be grateful to HLF for, both in Hastings and across the UK. It is an immensely important piece of public infrastructure, which is why it must be held to account when communities feel it is hurting rather than helping them. In 2016 I was awarded an OBE for services to community assets. I’ve always said that medal was for all of us who stand up to be counted, disregarding the snipers and the nay-sayers, taking a risk on hope. I’ve had hundreds of messages today from people across Hastings and across the country. You all say nice things but I do this because I can’t not. In the middle of the week someone admired my perseverance but said I was ‘pushing water uphill’. I listened politely and then said “as a specialist in pushing water uphill, I’ll carry on doing just that”. The question is not why I’m mad enough to do it but rather why does it have to be so bloody hard? When will we ‘exalt the valleys and make low the hills and mountains’? When is change coming if we don’t make it ourselves? This tragic fiasco is not just about Hastings Pier, any more than the HLF renovation funding or the Stirling Prize was. This has always been about economics and power. And particularly the power or otherwise of local communities to manage, expand and protect their own local wealth. The two Battles for Hastings Pier (2006-13 and 2017-18) stand in deadly stark contrast to each other. In one a very active community was eventually empowered by public funds to achieve the renovation of a derelict structure. In the other, the fully-restored asset was removed secretly from 5,000 shareholder-owners and then subjected to a commercial process that led, unfathomably, to where we are now. Abid Gulzar made an interesting point last night. He waved at the pier and said ‘it’s not going anywhere’. He was right; the pier is a ‘tethered’ asset – it will always be Hastings. I spoke to Alex de Rijke from dRMM earlier. While horrified by the injustice of the process and sad at its outcome, he’s relaxed about the pier itself – “it will survive Mr Gulzar and have another life after”. I was really pleased, honoured, and emotional to be at the celebration event on the Pier yesterday to mark the achievements of the Learning & Education Team which has been funded by Heritage Lottery Fund for the past 5 years. The people = so many people, so much love, so much uncertainty and dogged determination to win through regardless. Individuals should be recognised and valued but we must also give credit to the power of numbers – that’s what it takes. The achievement = the numbers, breadth, depth, diversity, and impact – all astounding. The legacy – in terms of archive and corporate memory – is precious and should be incorporated in the revitalisation of pier. Cohesion – the pier is our anchor, not just that everyone uses it but that everyone is involved in making it. I’ve brought some things which were kept for nostalgia as souvenirs. Yet here we are again – campaigning to save Hastings Pier once more! It has never been possible to walk away. I know, I tried! – to now where local people – working for free to protect the long term future of a critically important heritage, cultural and community asset – are treated as ‘just another bidder’ in a procurement exercise for a new guardian. 3. most of all to the staff and volunteers who have given so much and who continue to keep the good ship sailing despite the weather! Raise your glasses to the future of Hastings Pier.